I tried the Asian Chao in the UCF Student Union for lunch one afternoon. I ordered the two item combination and went with Kung Pao Shrimp and Beef with Broccoli. These were both served with a side of lo-mein. Although nothing great, it all tasted okay and was equivalent to the Chinese restaurants in the mall food courts. Being that the same franchise is in several of the local malls, I suppose that's how it should be. I ate at a restaurant called Tai Shan right up the block from Chinatown's huge Friendship Arch. Tai Shan wasn't my first restaurant choice in Chinatown, but due to a broken air conditioning in the first place, combined with some very hot travel companions, I ended up here. Tai Shan had an interesting menu. 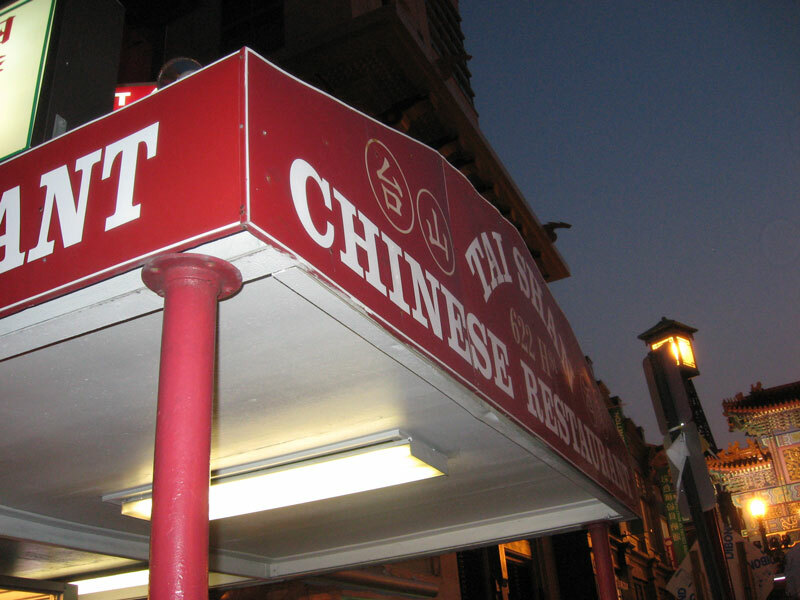 They had all of the American-Chinese food standards, along with a lot of stuff I had never seen in a Chinese restaurant. And that's what I would want in a restaurant in a Chinatown. I decided to try something new and ordered something called Chicken Yak-Mein. 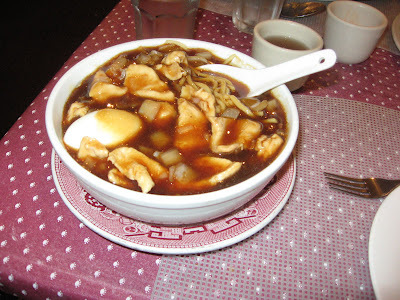 Yak-mein was a type of thick noodle soup. It consisted of chicken, a hard boiled egg, onions, and noodles, all in a dark brown broth. It definitely could have used some more variety in the vegetables mixed in since the end result was kind of brownish and lacked color. Regardless of how it looked, the yak-mein did taste okay and I finished a good amount of the soup. 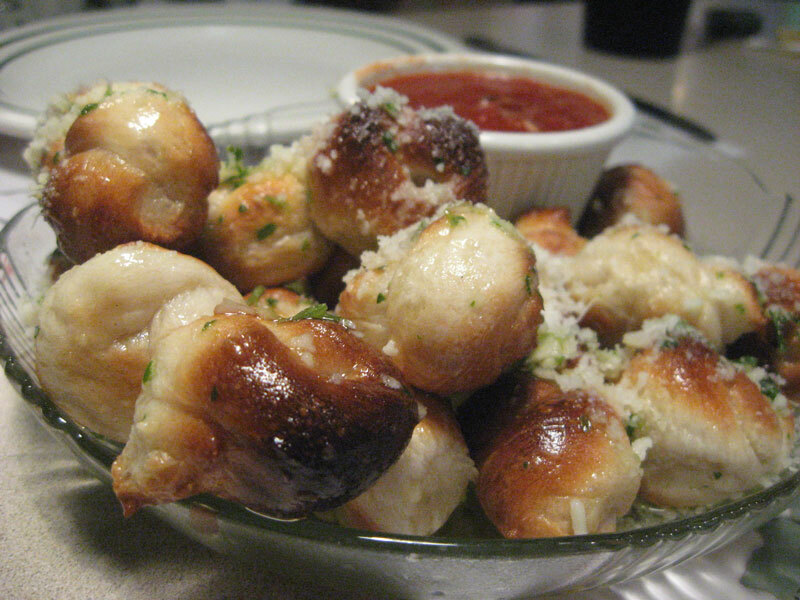 Here's another post from the Watch Me Eat archives of previously unpublished food adventures. 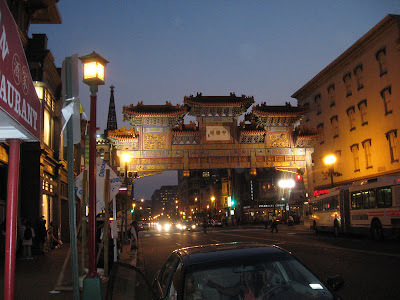 In this particular post, I'm going to expand from the food a bit and add some travel photos as well. Memories are fallible, but I will do my best to keep these posts as accurate as possible. Mistakes in the details may happen though. Feel free to correct! In June of 2007, I was traveling back towards Florida from a more northern state and took a side trip through North Carolina's Outer Banks. Ocracoke is the southernmost island in the chain of barrier islands accessible by car. It is on Ocracoke that you must catch a ferry to return to the mainland. While waiting for this ferry, I did some sightseeing around the island, including seeing wild horses (in captivity? ), ancient graveyards, and the Ocracoke Lighthouse. After the quick exploration of the island, it was time to eat before catching the ferry. We settled on a place called the Flying Melon Cafe. I remember I ordered the fish of the day. I can't remember what type of fish that was. I'm pretty sure it wasn't a fish commonly seen in restaurants, I'm thinking it possibly was scrod. The fish was served very simply, served over rice, with a side of zucchini. From what I remember, I had no complaints about the meal! I'm running low on my supply of restaurants/food stuff to write about at the moment, so for the next few posts I'll be digging into the Watch Me Eat archives for previously unpublished food adventures. Memories are fallible, but I will do my best to keep these posts as accurate as possible. Mistakes in the details may happen though. Feel free to correct! Today we are going back to September, 2007 to the lovely town of Princeton, NJ. After some exploring of the town, I ate lunch at an Indian restaurant called Mehek, located right across the street from the University. Mehek had a take-out counter on ground level and a dining room upstairs. We ate on the second floor. It was after the lunch rush, so we were the only ones eating at the time. Because of this, I chose to order off the menu rather than get the lunch buffet that was offered. I had the Curry Chicken. The dish came with a bowl of chicken and vegetables in a curry sauce, along with a side of rice, and basket of roti. I love the flavors of Indian food, and the food from Mehek was no exception. The curry was delicious, and I'm always amazed how much flavor the seemingly plain basmati rice has. If there weren't six states between Florida and New Jersey, I'd gladly return to Mehek! I ate lunch at Harmoni Market in Orlando's College Park neighborhood during an unexpected detour caused from an I-4 closure. The service was a bit weird when we entered, the group of employees standing at the bar ignored us for a few minutes until someone finally told us to sit anywhere. This awkwardness was followed by a drink being served in a cup covered in lipstick stains, but after the initial weirdness, the food and service were good. I ordered the Rockin Goat Flatbread. It consisted of rock shrimp, arugula, goat cheese, homemade mozzarella, and tomato sauce all on a whole wheat flatbread (baked by the Olde Hearth Bread Company). Although they called it a flatbread, it was technically a variation of a pizza. Seafood and pizza combinations always seem strange to me, but I liked this a lot. I'd gladly get it again! My only real complaint was that Harmoni was really stingy with the goat cheese. For a flatbread with goat in the name, I was expecting less mozzarella and more goat cheese crumbles. When looking over Harmoni Market's menu, it seemed to be somewhat overpriced (especially on the sandwiches). Since I shared the flatbread and there were plenty of rock shrimp on it, what I ordered wasn't too bad. It came out to about $5 a person and filled me up. I tried a restaurant creatively named Asian Buffet on Orange Blossom Trail in Orlando, FL. It was your standard Chinese buffet, although they did have some unusual foods that I haven't seen on other similar buffets. I started out by trying some of the Chinese standards. Lo mein, chicken with broccoli, shrimp, bok choy, and and egg roll. None of it was exceptional, but none of it tasted horrible either. It was middle of the road Chinese buffet food. Next up at Asian Buffet, I tried some of the assorted dim sum style dumplings that I cannot properly name. There were pork dumplings (I liked them the best). The ball that resembles a hard boiled egg was filled with a sweet bean paste. The other two sugar coated dumplings were also quite sweet, but I didn't like their spongy consistency. Finally, I tried some of Asian Buffet's sushi items. I find eating raw fish from buffets to be a scary thought, so I stuck with only items that were cooked here. I had some ebi Nigiri, inari filled with seaweed salad, and a delicious purple seaweed salad. I find this purple seaweed to be delicious, but it seems really rare that a restaurant will be serving it. From Google, it looks like this was either kombu or hijiki. The last time I ate at Anthony's Pizza was way back when smoking was still allowed in Florida restaurants. I don't remember much about the food, just that the smoking/non-smoking sections did nothing in the small restaurant. The place smelled horribly like an ashtray and left me with no desire to return any time soon. Fast forward to 2009. After receiving several email recommendations that Anthony's has the best pizza around, I decided to go back and give them another try. Anthony's had a wait when I walked in, so that was a good sign about having good food. The servers initially seemed really flustered by the amount of people in the restaurant, but overall, the service was okay. The half spinach, half meatball pizza that we ordered came out pretty quick. It was a really good pizza with a nice thin crust, a good sauce/cheese ratio, and it was pretty tasty. The sauce had a bit of a strange flavor that I couldn't quite place, but it was otherwise pretty good. I'd gladly get another pizza from Anthony's! I tried the new Carlos 'n Charlie's in Lake Mary, FL. Carlos 'n Charlie's is a chain based out of Mexico that currently has two locations in the United States. Given the entire United States to pick from, how a chain in Mexico chooses to open a restaurant in Lake Mary's upscale Heathrow neighborhood is beyond me. Tortilla chips in a paper bag and a bowl of salsa were served first. Pretty standard, although the salsa was a little too chunky for my liking. For the meal, I ordered Shrimp Baja Tacos. Or at least I thought I did. On the menu, it had a choice of fish OR shrimp tacos. The tacos I got had both fish AND shrimp. I didn't mind since I was having trouble deciding between the fish and shrimp when looking over the menu, but I could definitely see people having issues with getting both. Besides from the fried seafood, the tacos were filled with cabbage, onions, refried beans, and were served with a cup of really sweet sauce. The tacos did taste okay, but weren't worth the price in my opinion. At $13, I really would have expected some sort of side with the tacos, especially since you can get better seafood tacos elsewhere for more than half the price! Piper's is a sports bar, and as much as I don't like the environment in these type restaurants, I was mostly pleased with the food. We ordered a pizza, and being that this was bar pizza rather than Italian restaurant pizza, I wasn't expecting much. 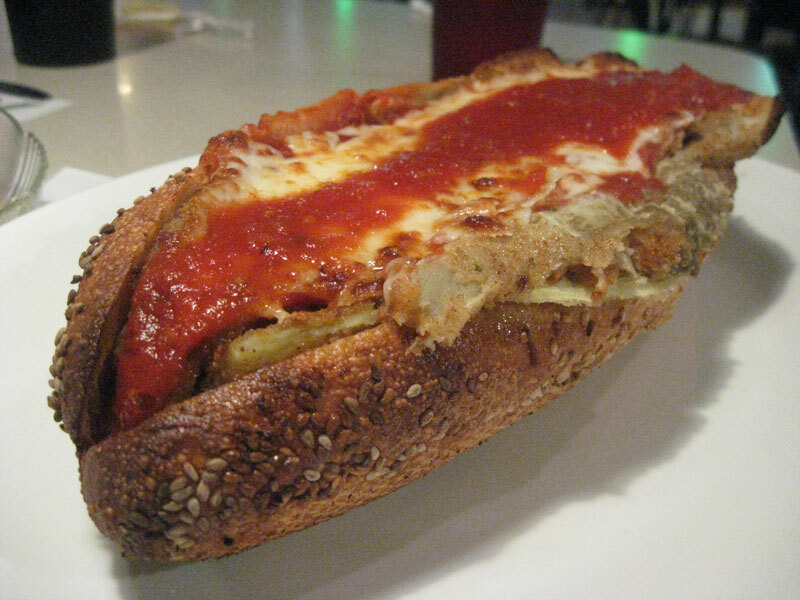 Sometimes in a sports bar like this, a pizza will consist of something frozen that was microwaved just for you. When the pizza was served, I was actually really surprised that Piper's makes real pizza, and it was pretty good! The pizza had a nice thin crust with a perfect proportion of cheese to sauce. I found the sauce to be somewhat flavorless, but besides from that, I was happy with the pizza! 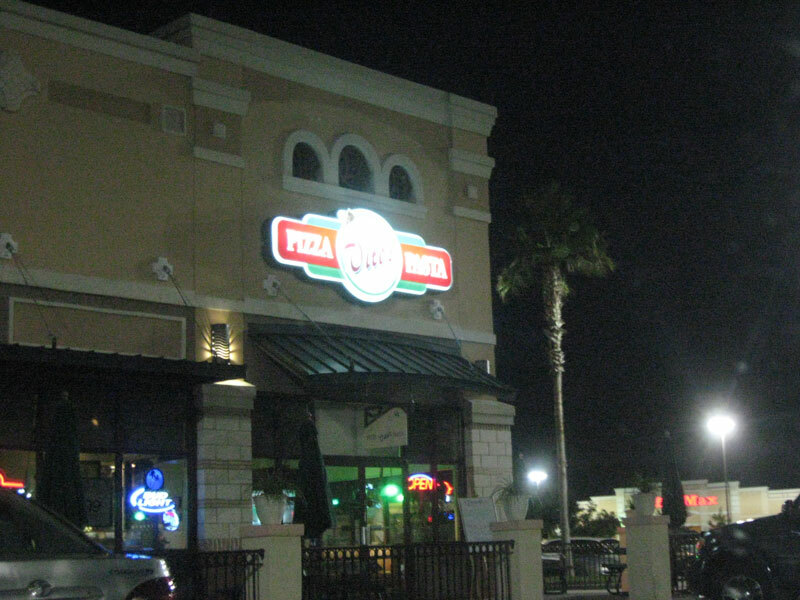 I found out from the Orlando Sentinel Last Call Blog that this location in The Plaza was originally a NYPD Pizza. That kind of explains why Piper's has a pizza oven. Vote for Watch Me Eat under the Foodies category in The Orbbies! You need register with Orlando Sentinel to get a user name, and then VOTE. EVERY DAY! I will be reminding you again! On Halloween, Taco Bell was giving out their Black Jack Tacos for free from 6pm till midnight. After I was done with my Halloween fun for the night, I ventured over to the nearest Taco Bell to try their newest featured food item.